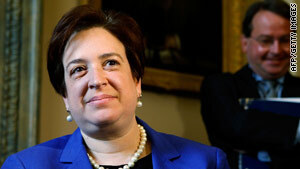 U.S. Supreme Court nominee and Solicitor General Elena Kagan meets with senators on May 12. One of the main indicators that a person is capable of postformal thought is the ability to hold two completely dissimilar thoughts in mind at the same time. And so it is that the subject I’m about to discuss is both cool on an epic scale at the very same time it’s really, really boring. Here’s the exciting part. Imagine you could go back to the Clinton era (I know, some of you are already crying), and view White House emails right in an email client, just like it might have felt to send and receive them in the White House. How cool is that? Remember, Clinton was in office just as the Internet was getting started, so many of our current email systems didn’t even exist back then. This was a time before the Bush administration’s whole missing email debacle, and waaay before systems like Gmail were even a twinkle in Google’s eye (Google, of course, didn’t exist then, either). Dear Anderson: I have the opportunity of listening to Mr. Nungesser yesterday and was so glad. He is a fighter for his homeland and this is the way I think we have to face the recovery of the marshes and beaches. It must be done before any "hurracane show up in the Gulf area".... Can you imagine the devastation??? We have to ACT before things like that happen. We need to make a convention attracting the best minds in the world in order to solve this problem!! Engineers from Holland are well known for their creativity in creating channels and I imagine to clean them too, I think we'll need that. Nationality should be put aside in cases like this, and hands on American to work on the recovery will be there for sure!! We need your A/C in the Gulf, Mr Cooper!! God bless America! !